“The Commuter” star Liam Neeson says the #MeToo movement has become “a bit of a witch hunt” and defended Garrison Keillor and Dustin Hoffman, two prominent men who have been accused of inappropriate touching. 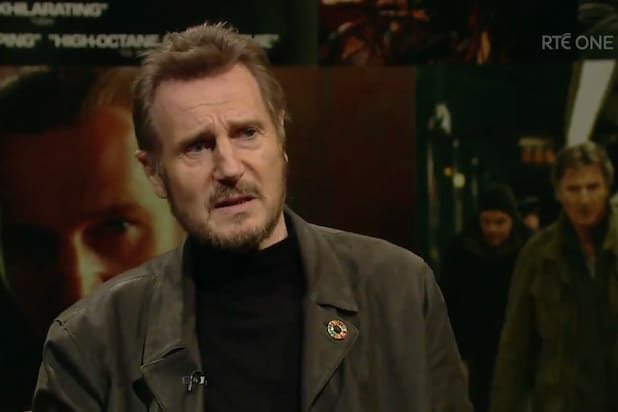 Appearing on “The Late Late Show” in his native Ireland, Neeson told host Ryan Tubridy that the reactions against some men accused of misconduct have been too severe. He cited as an example former “Prairie Home Companion” host Garrison Keillor, who was scrubbed from the program and fired by Minnesota Public Radio after he was accused of touching a woman inappropriately. In Neeson’s understanding, Keillor touched the women’s bare back while consoling her. Neeson shook his head at “the Harvey Weinstein stuff.” When Turbridy named Spacey, Neeson merely replied, “Kevin too,” not elaborating. But when Turbridy mentioned Dustin Hoffman, Neeson said he was “on the fence.” He then offered a somewhat confusing explanation for the accusations against Hoffman. Kathryn Rossetter, who co-starred with Hoffman in the 1984 Broadway revival of “Death of a Salesman” and 1985 TV movie of the play, said Hoffman repeatedly touched her inappropriately, cupped her breasts as they posed for pictures, and once pulled up her costume to expose her breasts to the crew. Still, Neeson said there are positive aspects of the reckoning about sexual misconduct.